Issy Darlington came to Woodhouse from Acland Burghley School and lives in Islington. 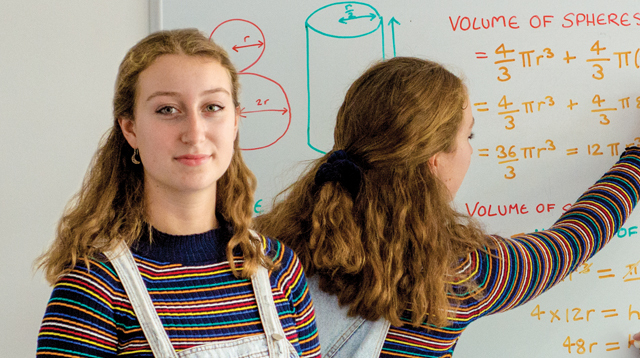 She studyied further mathematics, mathematics, physics and chemistry at A level and graduated in 2018 with A*A*A*A*. She is currently at Oxford University studying physics. “I’ve always found great comfort in maths. When everything is messy around you, maths is logical and always there. I like how you can solve real world problems using numbers and get a definitive answer. I wanted to study in a place where there would be a lot of mathematicians. I chose Woodhouse so I could be around like-minded individuals who I felt could push me and help me get better. I chose further maths because it goes beyond the curriculum. I was waiting for maths to get hard, and now it has,it’s exciting. Maths is really well explained here and you get clear notes, so that you understand the foundations of it. If you ask a question like ‘why?’ and it’s slightly beyond the syllabus, the teachers will be still able to answer it, there’s never that ‘You don’t need to know that’ like you might get at GCSE… They know their stuff. And there’s also lots of extracurricular maths here. We all did the UK Maths Challenge (I got a gold) and I took part in the Team Maths Challenge which was really fun and pushed us even more. We competed at a Queen Marys competition and I think we came tenth out of forty, which is pretty good. In the maths building there’s a whole top floor space, a dedicated maths learning zone, where you can come and do extra maths and if the teachers are are free they will help you, whenever… it doesn’t even have to be your subject tutorial. I went on a great trip organized by Woodhouse to a ‘Women in Maths’ day at Oxford University and I got to listen to lectures and do hard problems. We also went to see a lecture by Dr Hannah Fry (who I like) called ‘The Curious Coincidence of Maths in the Day Time’ which was about the maths behind the ‘Curious Incident…’ book, it was a good day out. Woodhouse is a really lovely environment. It’s not cliquey, there are groups but everyone kind of gets on with everyone. I like how it’s just a sixth form college and even though there are so many people, you will always find your people. It’s more university like, and you are trusted to do your work here, which I like, rather than being forced to do stuff that you don’t need to. I’ve always been, very much, an independent learner, but sometimes… you can’t do work. You have other life commitments or things are going on. I’ve had times like that, where I couldn’t work, and the teachers here were very understanding. They trusted me, knew that I would catch up and treated me like an adult. There’s also time for lots of extracurricular. I went rowing at the end of term. I’d rowed on a machine before, but not actually in the water. I got to have a go in the scull single boat and do proper Olympic style, it’s quite rhythmic. I also did yoga just before exams. They offer so much here, I didn’t even have to go anywhere, I’d just finish my class and go to the sports hall for yoga. Great. Outside of Woodhouse? I play the cello and have done since the age of five. I took my grade 8 in year 10 and now play in the Camden Youth Orchestra. For me, music has never been related to maths, it’s always been about the whole emotional side which I can’t really explain… I plan to keep it up and be part of an orchestra, but it’s not a career goal, I just enjoy playing. I’m planning to study a physics degree and am applying to Oxford, Manchester, Edinburgh, Bristol and Durham. I spent all summer debating between maths and physics and it was a hard decision for me. Ultimately, I’d started to enjoy maths for what it could do rather than the simple act of doing maths, and physics felt slightly more purposeful for me. It’s everything I like about maths, but in a world context. I’ll study either physics, theoretical physics or mathematical physics – and plan to study for a masters and then PHD.